We remember Hairol walking into our 7pm Bootcamp classes quietly, always with a smile on his face. 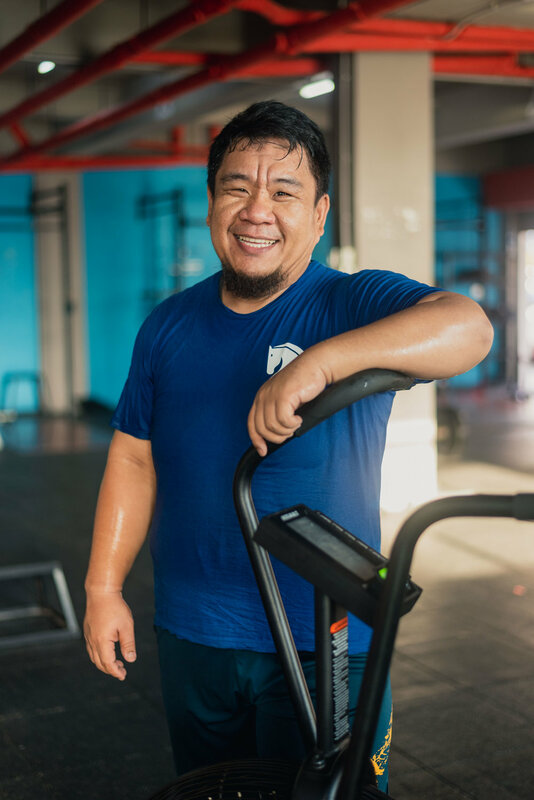 As the weeks passed, we started seeing him in our CrossFit classes and a lot more in our early classes, still with the smile that never waivers. Nowadays, he is usually among the first to walk in the box and his hard work shows in the consistency of his performances. I joined CrossFit when I was thinking about trying out new sports. I started with running, then I joined Bootcamp. I then started watching people who did CrossFit and I found it interesting. What keeps you here and still sticking with CrossFit? I like the intensity CrossFit gives. I like that the program is run with a class and I get to workout with everybody else. I like to think of it as sharing the pain and the fun with others. Coming into Jbox, I had a goal in mind and it was something I had to do to achieve that goal. I wouldn’t say I fell in love with the idea of working out at first sight, but as time goes by, it slowly became a part of my daily routine. Name us 3 movements you don’t like! Anything gymnastics, running, and anything to do with front rack because of my mobility issue. Have you worked in these weaknesses? The one thing that I started working on was my squat depth when I first started. I am now quite happy with my squat depth. I think that’s my main achievement so far! Do you see yourself doing CrossFit for a long time? Yes! Nowadays, CrossFit is a huge part of my life. If I don’t come in the box to workout, I feel like I’m missing something in my daily routine. Would you recommend CrossFit to anyone else? Yes! I think it’s really good for people who are still looking to get into different kind of sports. CrossFit offers you variety of movements that you can explore. When I first started getting into fitness, I only ran. It wasn’t very varied. What would you say to newer athletes who are thinking of starting CrossFit? I would say just join in the fun! Maybe start with our bootcamp classes, don’t get intimidated with the seasoned athletes and do not be scared to scale down if you have to! Most importantly, just have fun! I’m really happy being a part of the Jbox community and I have absolutely no regrets joining this family. I feel very welcomed in this community, the 673 community in particular. I love how very close knit we are! He is now one of the key elements in our community that keeps the friendship alive. Known for his love of the brand Virus, you could see him wearing his bright gears and most probably, that tells you that he is ready to take down the class WOD! We are proud of Hairol as an athlete and we are thankful for him as friend. Keep on grinding, Hairol!